After going through all these posts I thought I might just chuck in a little post. Most of the post are for slip ons. A slip on will NOT give you much more power unless the std exhaust is very restrictive and your fuel system can accomodate or be accomodated for. In the case of the of the MT/FZ the std exhaust is quite restrictive but not VERY restrictive . The big elephant in the room is of course that NO 2 into 1 one exhaust is going to work properly on a 90/270deg crank engine It needs 2 into 2 so any 2 into one you are putting on for reasons other than real power increases. The most real and obvious reason for changing the exhaust is weight. The standard system weighs a ton ( OK not quite but you get the purpose of the hyperbole) . Most systems will weigh considerably and functionally less. That equals better accelleration right there. Other reasons that don't contribute to performance are looks and sound. Totally subjective and I can't help you with these. Some like death metal, some like smooth jazz. Some like Rembrandt, some like Mondrian. That's your choice but don't pretend it makes a better bike. Back to exhausts. The MT is a low rev torque and relatively ( for a jap bike) low rev max. HP . The pipe to be anywhere near helpful is going to be longer than most. That's just physics. Akro gets around that in the carbon by it's beautiful snail bend pipe. It's still out of phase but at least one of the cyl will get sort of pulse reinforcement. Any pipe that goes straight down and terminates under the bike where the stock pipe does will not be optimium length, no matter how cool it looks. So having established that most of the pipes offered are for looks value not performance , we can work with which may give at least some benefit for the vast amount of money spent for little real effective power gain. The std headers are fine . A bit heavy, but fine. Unfortunately they are welded to the aweful pong box/cat/muffler. The std "collector" has the thread for the O2 sensor. It would be possible to cut the collector just behind the O2 sensor thread and wled in a 2"pipe ( 2" only because it is easy to get mufflers for and is about a good flow size for the header pipe sizes ). Then a outlet pipe of a "correct length" to a lightweight effective muffler. I currently cannot tell you what that length is , but if someone wants to degree the exhaust cam and give me the ID of the valve seat I will happily calculate it for you. Just be aware that whilst it is still 2 into 1 , the pulses will be perfectly wrong ( out of phase just when they shouldn't be). At least the valve seats will stay happy. OR you could buy a lighter set of headers with it already done. OK the can. You want light and effective ( perhaps not TOO aurally effective). If your headers come with a decent can attached already, problem solved. If you want to go modded std headers or use a different can to the maker of the headers you have a wide choice. Unfortunately most aftermarket cans are ridiculously overpriced. Choose on weight and muffling first then on looks. Personally I tend to use TYGA cans are they are cheap, well made , sound good , light weight and as it happens look good as well. http://tyga-performance.com/site/product_info.php?cPath=71_815_817&products_id=2260. Just stay away from the Motomaggot. It is a great racing muffler ( I have used a few of them ) but WAAAAY too loud for the road. There are plenty of others. Remember the muffler will NOT give you more HP. It can only do it's muffling job. I just simply got min for show & tell, weight savings and sound. I don't necessarilly care I don't gain any performance from it. I'm happy with what it already does. 7lb = 1HP or something like that. I'm thinking the FZ needs a proper belly can (KTM RC8 or Buell XB) or the 1-into-2 system like employed by the KTM 690. Renegade used to do a 2-can solution but I think it was a 2-1-2. A longish automotive Cherry bomb might work if you could phase the initial runner. (www.youtube.com/77c7751e-90e6-40e5-8da7-938735a61704) And considering how cheap they are, you could buy 6 and slice/dice them to play with. I'm thinking maybe 2 of the 'glass packs' slung underbelly? 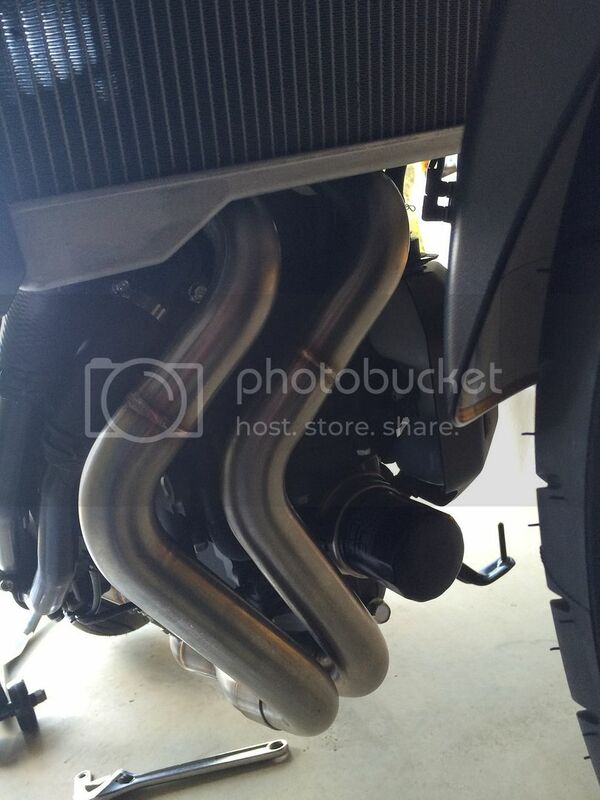 Dan-Moto isn't shy about bending headers, think maybe we can convince him to do a 2-2 system? Either with twin cans ala Monster S2 or one on each side aka SV1000. For 'cans' I actually like the SuperTrapp tuneables myself. I would love to see a proper tuned length 2 into two and reflashed ecu or Power commander to good AFR's. NOT 2 -1-2, but two separate systems to keep the out of phase pulses away from each other. The tuned lengths of this bike will be quite long because of the lowish peak HP rpm ( depending of course on the camming as well). I suppose you could run the pipes under the middle and curl them back into the mufflering chambers, then exit the chambers to the rear. Much easier just to put the pipes straight out the back. both on the same side OR one on each side. As I have stated in other posts 2 into 1 CAN be made to work by having full tuned length pipes empty into a chamber of sufficient volume for the gas to act like it has emptied into open air. But on a bike with 340cc cyl that would be a really big chamber. I worked out this method when trying to design an exhaust for a CBR250RR. The usual 4-1 or 4-2-1 is actually almost physically impossible to make because the revs are so high and the camming so severe that the first join was physically too short to join the pipes of the outer cyls. But it only had 62cc cyls so the volume I calculated to be virtual atmospheric was 680cc ( that's off the top of my head, it was a while ago but it is ball park figure). That scaled up for 340cc would be a substantial volume. At the lowish revs it would be a fairly long pair of pipes as well. Not saying it is impossible but certainly a challenge. But as a 2-2 would work just as well I think that might be a more elegant option. The pong box solution would be quieter though for the same flow. My napkin math says a 4x10" oval x 14" long cherry bomb has a volume of 9800cc. If you used one of the low-restriction models would that count as open-air? Would one then need an external sound attenuation device? Or can you use fiberglass inside and still have it behave with sufficient open-air characteristics? I just got the official 'brush off' from Dan Moto. But nothing says one couldn't still use some of their components in a 2-2 system. It is possible . But it has to be around the END of the two pipes. One thing that makes it a bit easier is that so long as the single outlet is the same size as the SINGLE inlet size ( not all the crossections added together), in theory there will be no pressure build up. Still I suspect the tuned length is going to be well over 42inches ( that's NOT a calculation but a guess based on previous pipe calcs) It is going to be a fair bit back. You could run the pipes into a chamber that went all the way to the back wheel, and the pipes went almost all the way back, I suppose and had a decent profile that wouldn't restrict cornering or ground clearance too much al la Buell. Still easier to go 2-2 I think. or an undertail ( which I hate but that is probably cause I lived in the tropics for most of my life and hot seats are not pleasant). A fibreglass pack would not emulate open air well enough. The pulse has to expand as if there is no resistance. Stainless mesh or titanium might work but the beauty of the true pong box is that the pulse transient expands loses huge amounts of energy and bounces around attenuating until bits of it go out the outlet . Doesn't really need much restrictive baffleing. That how car mufflers work ( well good ones anyway). I like the idea of twin pipes as pattonme mentioned. I used to have dual's on my little XZ550RJ and I miss that sound. It's like exhaust note heaven in stereo. 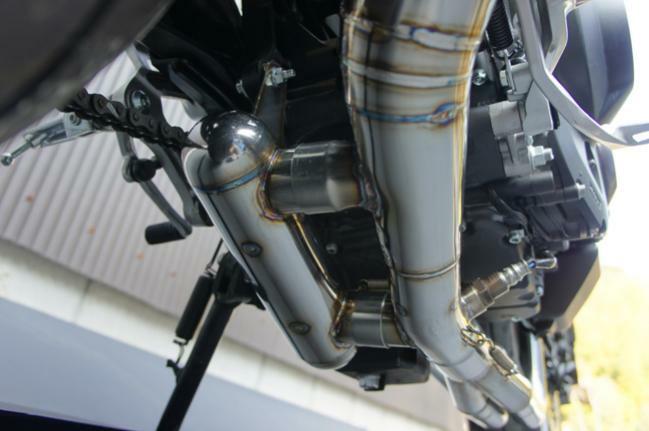 The gpr exhaust would take minimal fabrication to turn into a twin exhaust. They have the longest runners I've seen. Yes they could be the place to do it. I also have a Husky TR650 which had a one into 2 ( God know's why. Prpbably a hang over from the BMW setup forr their original version of the 650) They was very accomodating for a user on one forum, and made both one into one AND a one into 2 system. They make VERY good exhausts and seem more in contact with their customers than most. Actually they are my pick of exhausts although their first ineration of the MT07 exhaust was seriously ugly and too late as I had already bought a carbon Akro. I wonder if we have an italian member of this forum could approach them. They have a UK branch who might be approachable. 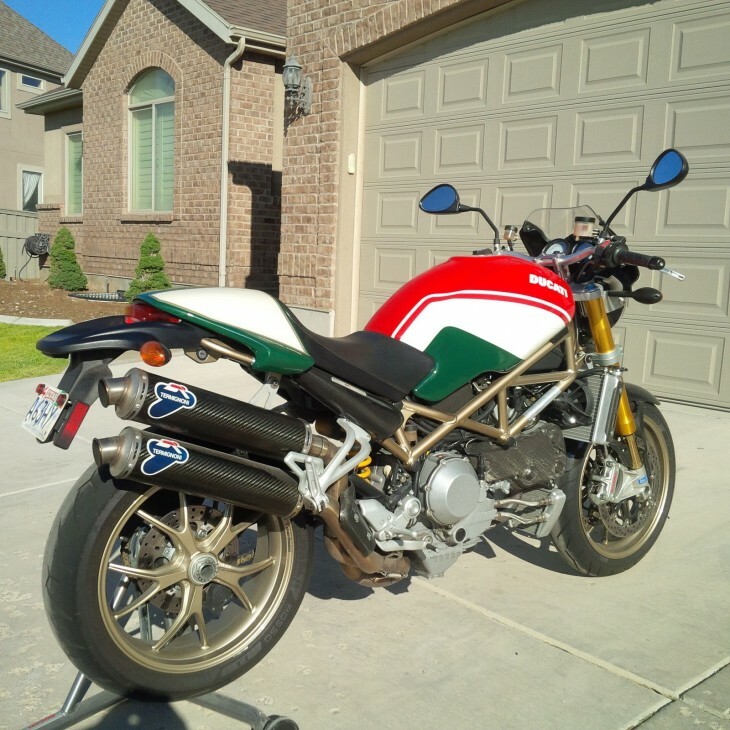 The Ducati is how to do it right. That is what we need. 2 into 2. We need to think virtual Vtwin not parallel twin ( 180 or 360 crank). Termi's are awefully loud though. I aren't in favour of stealth bikes but Termi's noise is a bridge too far IMHO ...but they look sooo nice. Found this by accident. still not right, but not a me-too product like everybody else. I really love the Two Brothers S1R System. What a great looking exhaust and great sound. Here is the install and sound if you want to check it out. I'd forgot about the magnificent/aweful SVX. Potential to be one of the great motors and they screwed it up by making is singularly unreliable. Instead of improving it they dumped it. You could hold up the 550 motor in one hand and the HP was insane. That should be the basis for MotoGP2 not the beige Honda 600 4. I went and looked up the aftermarket exhausts for them. Arrow did it RIGHT. Though we would need longer pipes there is plenty of unimpeded room for them. Anybody got any friends in Arrow? Or just as good GPR. This is probably the closest to achieving a 2-2 but with a single muffler inlet. The joint is at the very end of the runners unlike some of their other examples Arrow themselves did for the same bike. Just beautiful pipe work. Remember what I said about a hivolume pong box. This could maybe one. Those motors had incredible power for their size ( and lack of weight). If you want to see beautiful pipework have a look at the NSR250 (mc23 I think) snail expansion chambers. I had a set . They are literally works of art. The Japanese (and Italians) aren't half bad with the exhaust design and trying new things. It's from Tsukigi Racing. Conversely, this is just a full helping of WTF. I am guessing some serious resonance physics going on here. Funny place for it though as the first set of pulses would have already wrecked their havoc before they get to the chamber. I would love to know the theory and actual results. Helmholtz resonator??? for what aim? Interesting. Oh that pipe work....Looks like another one where they have calculated the length and forgotten the phase problems. What a waste of beautiful welding work. Anybody on this forum know these guys. I would love to see them make a 2-2. Did I say beautiful welding work. Ok following a hunch I decided to chase images of the YZFR M1 MotoGP bike exhausts and managed to find a few. VERY enlightening and confusing at the same time. For those who don't know the inline 4 Yamaha MotoGP bike is a crossplane crank like the MT/FZ. It has only ONE outlet. So I figured I would see what they had done about the out of phase issue. Well blow me down with a piston, The exhaust config is exactly how I though they would NOT do it. The crank config in the motor is 1 and 4 parallel and 2 and 3 at right angles to them ( and parallel to each other). Each side of 2 cyls. of the the M1 motor is like an MT/FZ07 motor configuration. That would mean that the logical old school method of pipe run would be 1 and 4 together ( inphase) and 2 and 3 together( inphase) then figure out how to get around the phase problem with 2 pipes. It ISN'T. The pipes on the M1 are 1 and 2 together and 3 and 4 together. That should be just wrong with standard thinking. How and why? The Formula one guys have been playing with stepped reflectors closer to the head. The motoGP pipes do this it seems. That is they have diverging and converging sections before the pipes join. We are talking serious physics here. Now the M1 pipe pictures I looked at were made by Akro, so I went and looked at my Akro. It has smooth pipes all the way to the junction so they didn't bother doing it right on the road bike pipes. The Arrow MAY have a step. I can't tell from the pictures I can find. If anyone can tell me if the Arrow headers have changes in the header diameter I would be very grateful. It could explain why the Arrows have better output on this motor. At any rate , if you are building your own exhaust, unless you can get the formulea they are using, I would stick to 2 into to for peak power. The pipe diameter from the exhaust port to the first weld flares from 35mm to 37mm and post weld is a constant 37.5mm diameter to the 2:1 link-pipe. Hope that helps gregjet, but from my understanding of fluid dynamics, the increase in diameter would help accelerate the flow.